We are so proud at Engage to have such amazing talented entertainers. From getting your guests onto the dance floor, to flooring them with magic while they sip cocktails, to the photo booth pics that will be floating around social media for days after your big day. These entertainers are good at what they do, so if you want to make sure you and your guests have a great time then look no further. Blue Mark Entertainment is a one stop shop for all things entertaining! They provide DJ’s and live bands, dance floors and lighting, evening photography and videography, LOVE letters and photo booths, draping, confetti canons, and the list goes on. Mark and his team are friendly and professional, they are great at what they do and you will be sure to be impressed! These guys are top notch. Jon and Dan have 30 plus years experience in the wedding industry and have a reputation that proceeds them. Their guests rave about them, they win awards, and they will be sure to make your evening one to remember. If you choose JN sounds for your evening entertainment you will not be disappointed. DanceMatters is a dance school based on the border of Cambridgeshire and Hertfordshire. They love teaching couples to dance for their first dance at their wedding reception. Whether you’re looking for funny or classic, they will work with you to create a something that suits you and regardless of your experience. Its a sure way to entertain your guests while making lasting memories. The young and super talented Dom is all over the wedding scene in our four counties. 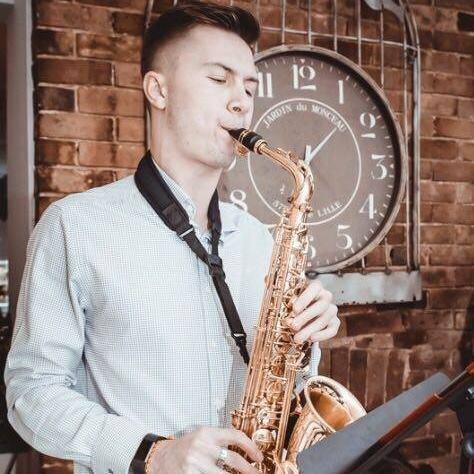 He is a master at providing current and classy sax music which makes every event he enters that much better. We love his repertoire of classic to contemporary songs and he can even play off your chosen DJ. Dom is a sure way to bring the atmosphere to any wedding reception. This Cambridgeshire based DJ company are pros with over 12 years of experience in the industry. They do sound, lighting, and prop hire for your wedding and always make sure you and your guests have a great time. If you are looking for letters for your day, your name in lights or LOVE, be sure to give these guys a ring. If you want your wedding day to be musically memorable - then Ariella Strings are for you. The award winning professional string group specialise in wedding day music, and love to entertain your guests. They don’t just play classical music, this fabulous string group can bring elements of pop, jazz and even rock music into your special day.